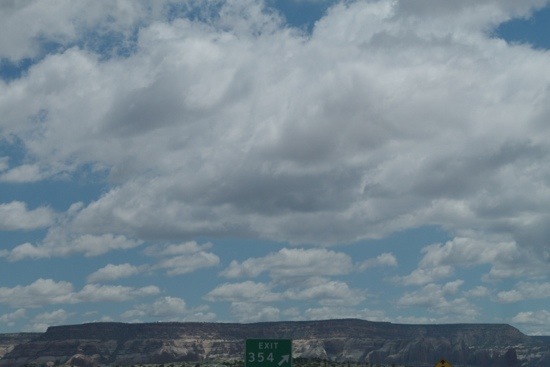 Today’s travel has taken me into the western half of New Mexico, which provides an abundance of views that are breathtaking (whether the photos are or not). Actually, I can barely tell what’s in these photos, as the software I’m using presents them as images smaller than postage stamps. You’ll also have to forgive tilting and in some cases poor aim – all were taken by simply holding up the camera, without benefit of either viewfinder or LCD display. Just shootin’ blind and hoping one turns out! 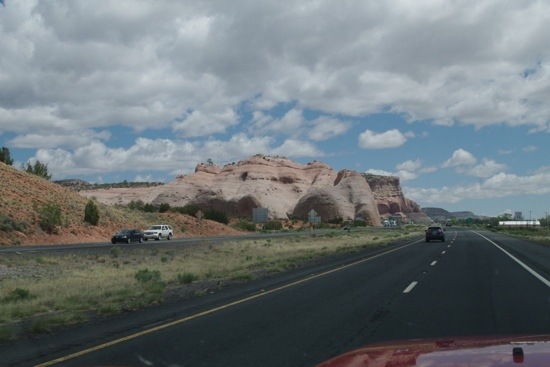 Regardless, there’s no way to drive I-40 through this state without gawking like a rube in the big city for the first time. Fast transport through this state is a waste of life. pieces of it here and there, and signs pointing to it at this exit and that made their siren call. There’s no practical way to feel your way along old 66, since it was an ever-changing hack job from the start, and much of it is now dirt, dead ends, and mystery trails. While I drove along, I figured that somebody somewhere must have researched and pieced together a GPS map plastered with waypoints that navigate the old route(s), and they did. One guy has apparently done it in 2006, though it’s from cobbled-together info, not from actual travel. 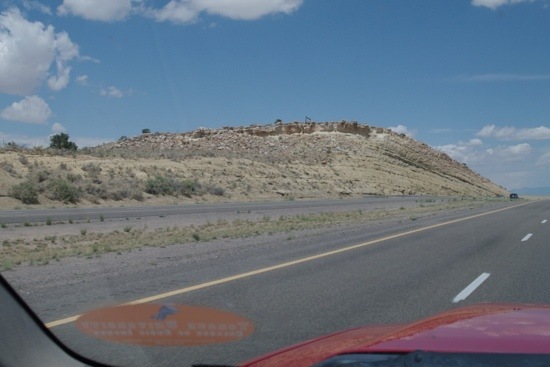 There are pieces further west that maybe you can take, and maybe you can’t, depending on your vehicle. But still, it’s quite something. Other GPS maps exist, but they merely assemble various businesses and tourist traps as waypoints to stop and see. It’s the revenue approach. 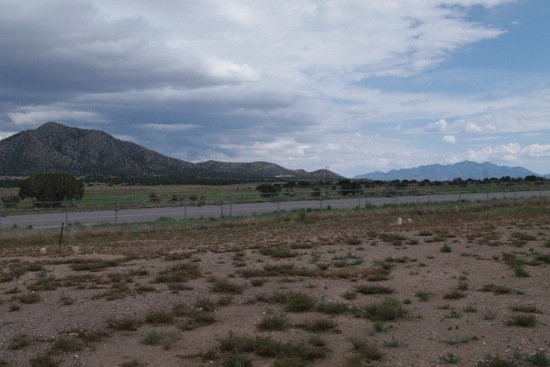 This approach gets awfully thin in New Mexico and Arizona, since vast stretches of 66 here are devoid of anything to use as an attraction reference. Nothing but ghost towns too rotted away to even dot the landscape. That’s what I want to see, not warmed over and updated “nostalgia” stops that lack any authenticity. 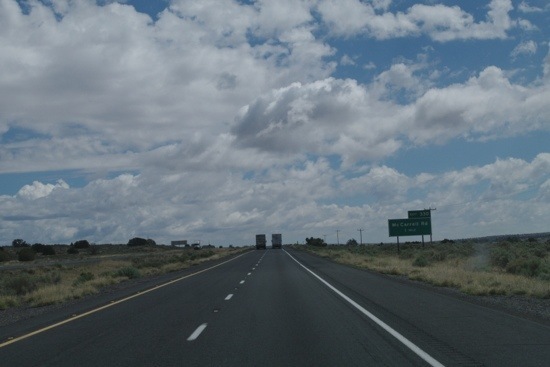 The trailer will make much of the route impractical, but I hope to do what I can, when I can. Future project. The one above is apparently lava, and there’s plenty of it all over for miles. A nearby RV park is called “Lavaland”, and the long rivulets of broken-apart black rock are amazing. One more thing to stop for – when I have time. 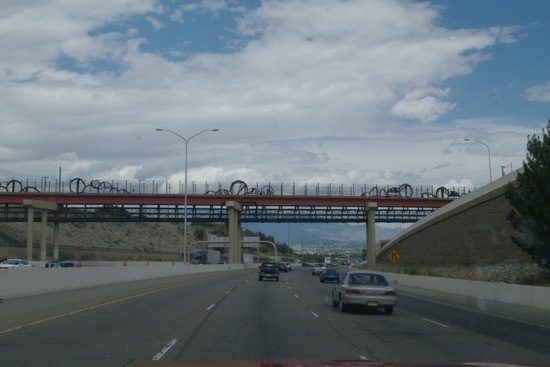 A few of the overpasses in Albuquerque have huge native-American-inspired metalwork sculptures that are a major wow. 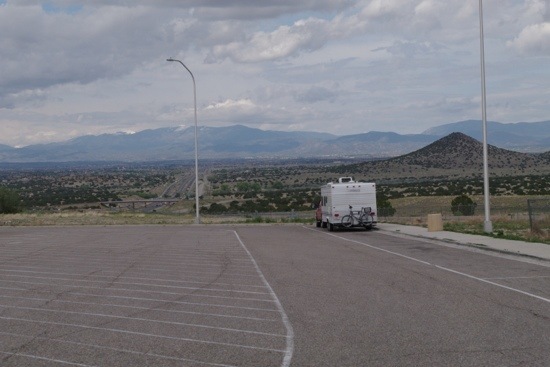 The stop o’ the day, a rest area near mile marker 238 north of Santa Fe. It was posted as having free WiFi and an information center, but those, like many, are closed since the Big Crunch. Where you headed in such a hurry? I must have missed something. Up here in Idaho we have those ribbons of lava, too, because the Yellowstone caldera used to be underneath us thousands of years ago, before continental drift. That’s what carved out the snake river valley across the southern stretch of the state. It’s beautiful stuff in a stark way. My storage unit is next to a 25 foot cliff of lava and it’s nice to just stand there and look up at the hawks circling on the thermals. If you ever make it up to southeastern Idaho, be sure to check out Craters of the Moon National Park. 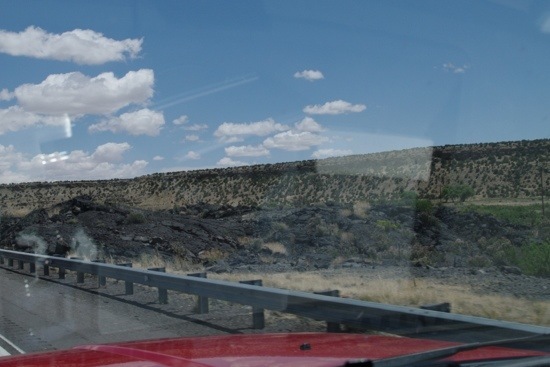 It’s a giant lava flow with a circle of road set in and the landscape is strange and other-worldly. Worth a look if you’re in the area. Well, that sure sounds interesting. So much to see, and so little fuel money! 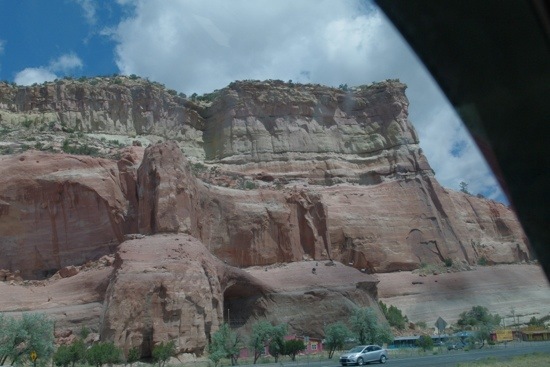 I will note that CotM National Park on my Places to See list, though, (possibly even before Bisbee, AZ). 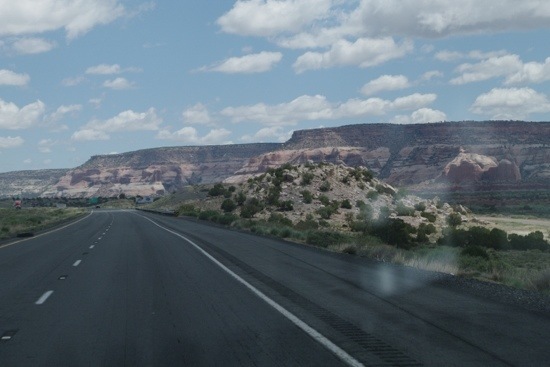 If it is mostly the driving of Historic Route 66 that interests you just take the I-40 frontage road and the business 66 route through towns and you’ll be on Historic 66 most of the time. We stopped at a lot of the Route 66 museums because we we after the nostalgia part of the experience. We also ate in a lot of cafes and diners. Yep, I noticed that, which is why the Historic 66 signage is up. I once went through an almost-ghost town with a lot of sun-blasted, dead but as-original businesses one after the other. Very close to the Interstate, too. They even had a sign up on the main drag for free land for anyone wanting to move in and set up a business. I like museums that try to depict life along 66 as it was, rather than simply displaying branded objects of veneration, if you know what I mean. Stopped in Santa Rosa (remember that, Matt?) and liked a restaurant there. 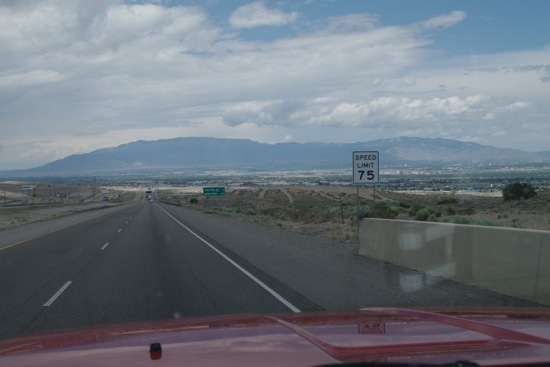 They had a four-lane section of 66 that was nothing to sneeze at.